I'm always looking for an excuse to use my almond extract. I don't get many opportunities because I serve some pretty picky eaters, and for some reason, almond extract goes hand-in-hand with nuts, raisins, onions, and a few other most-commonly-avoided ingredients among friends (and children....huh, strange coincidence). This is so annoying since I love all those foods! 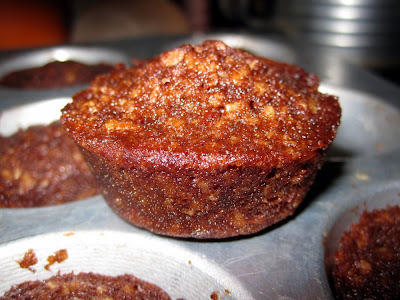 But I decided I would make these chocolate almond cakes because they sound excellent, easy, and I'd be offering them at a party attended by mature palates. The sissies can just deal! The recipe is inherently good because of its author, David Lebovitz. But one taste and you don't need to be sold based on author. 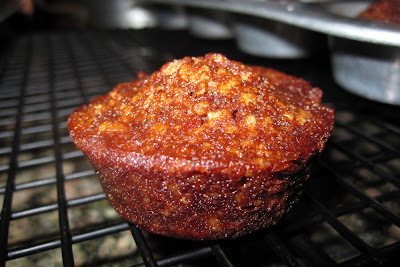 The instructions say to finely grind the almonds, but I left mine slightly coarser because I wanted some crunch in the cakes. Either way works great. And don't you just love the French name? Financiers au Chocolat. It's so pompous and showy in all the right ways! It allows a silly little home baker like me the chance to make something that sounds way harder than it is, as if I attended a cooking school in Paris or something. If you're a fan of almonds, then you're in for a treat. 1. 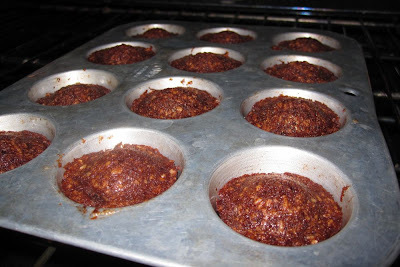 Preheat the oven to 425 degrees F. Lightly butter mini-muffin tins or a silicone baking mold with 1-inch round indentations and place on a sturdy baking sheet. 2. Melt the butter in a small saucepan and set aside until room temperature. 3. 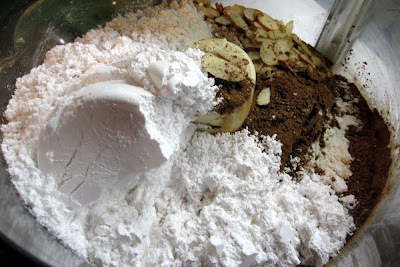 In a food processor or blender, finely grind the almonds with the cocoa, flour, salt, and sugar. 4. 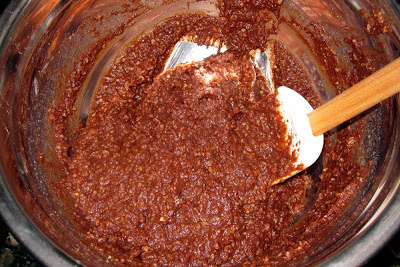 Transfer the mixture to a medium bowl. 5. 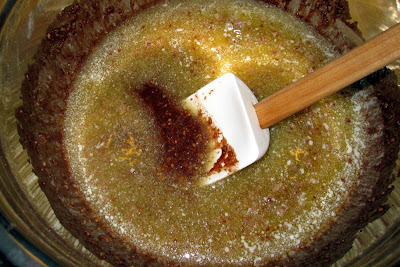 Stir the egg whites and almond extract into the ground almond mixture, then gradually stir in the melted butter until smooth and fully incorporated. 6. Spoon the batter into the molds, filling them three-quarters full. 7. Bake for 10 to 15 minutes, until slightly puffed and springy to the touch. Remove from the oven and cool completely before removing from the molds. 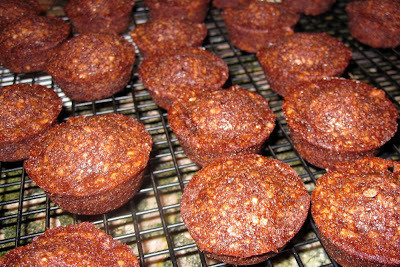 Storage: Once cooled, financiers can be kept in an airtight container at room temperature for up to one week. 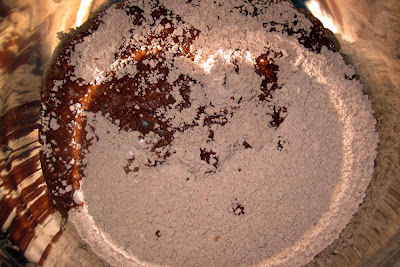 The batter can also be made, then chilled and baked up to five days later. I agree...any chance to make something with almond flavor must be grabbed. The name sounds so sophisticated and, since I was there when you made them, I know how good they taste. I really liked them with a cup of hot tea. And recommend others try it that way, too! More almond, more better. Maggie, age 6, says "oh, yum!" Mom - Yes! They are so good with tea! or coffee. Deborah - You are so lucky to have a daughter who says yum to almond flavoring! Carolyn - I'm so glad to hear you still bake with almond paste despite your husband not preferring it. Sometimes you just deserve a flavor you love! Do you think you could use madeleine molds with this recipe? Hi Bob, yes, I think madeleine molds would be great for this recipe. 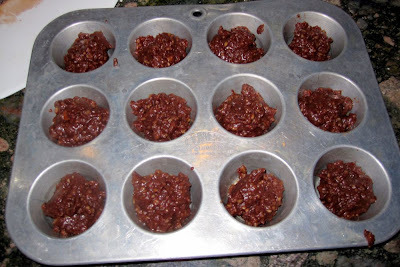 Just watch the timer because it might take a minute or two less to bake if the molds are more shallow than cupcake pans. Good luck!